Here is a free mini version of my Flip-Flop Figurative Language game (available in my shop). This version contains 27 game cards (fill-in-the-blank similes). If you like this, check out the FULL VERSION, which includes 108 figurative language game cards OR the Classroom PowerPoint Game! A holiday surprise for you and your students!!! This vocabulary mini game includes 24 vocabulary strategy cards with a variety of holiday and winter vocabulary. This interactive PowerPoint game can be used during individual, small group or classroom group activities. 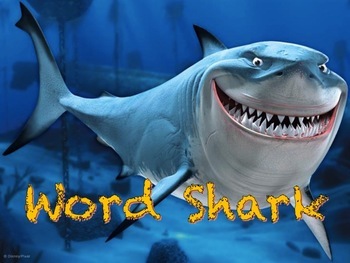 Word Shark is a vocabulary game that addresses word roots and prefixes/suffixes. This game is set up similar to BOGGLE, but the game board has root words and prefixes/suffixes rather than letters. The goal is to find REAL words by combing a root word with a prefix and/or suffix. The timer begins automatically when you click to reveal the game board. After a minute, the shark will appear, hiding the game board. Count all the letters in the words you find. Each letter is worth 1 point. The player There are 20 slides included. Each slide has 3-4 words that are associated in some way. Students must decide what category they all belong in. Enjoy!! with the most points at the end of the game wins! Here is a printable card game (like UNO) you can use to teach and practice new vocabulary with the following prefixes: non-, mis-, un-, dis. Use this game for therapy, intervention or as a center activity in your classroom. There are 20 slides included. Each slide has 3-4 words that are associated in some way. Students must decide what category they all belong in. Enjoy!! An interactive PowerPoint game that you can use to teach and practice categorization. There are 18 game slides included in this game. How to Play: Click to each slide. Name as many items as you can think of in the target category before times up. Earn 1 point for each correct item named in the target category. An interactive PowerPoint games that focuses on listening skills and vocabulary development. This game targets 2nd-3rd grade level vocabulary. Students have to identify words when the definition is presented. Divide your class into teams and make this activity into an engaging class game. What a fun way to learn! 24 compare-contrast cards and 12 additional game cards are included in this set. A data sheet is included! Print, cut and laminate cards. Shuffle the cards and place them face down in the middle of the group. Students take turns picking a card and explaining how the 2 items on the card are the same and how they are different. There are other fun game cards included to make the game more engaging! You can also use these cards and writing prompts. Have your students brainstorm similarities and differences between the 2 items. They can use a simple graphic organizer to jot down their ideas, then create a simple paragraph to compare and contrast the items. This is an excellent way to help students who have difficulty coming up with ideas during open-ended journal writing activities. Print, laminate and cut out cards. Place each group of cards in an envelope or bag (for students to access) and attach to bulletin board. Put Velcro or magnets on the backs of the cards and on a sentence strip. Leave enough space for students to be able to stick the cards in order to make a complete sentence. You can also use these sentence sorts for intervention or therapy practice. Cut out cards and present each set (sets are numbered) to students. Have them put the words in the correct order to make a grammatically correct sentence. You can also have students write the sentences in the correct order and have them include correct capitalization and punctuation. Have students make these sentences “juicier” by adding other adjectives, adverbs or prepositional phrases (or creating new complex sentences with conjunctions). BULLETIN BOARD ACTIVITY: Place each group of cards in an envelope or bag (for students to access) and attach to bulletin board. Put Velcro or magnets on the backs of the cards and on a sentence strip. Leave enough space for students to be able to stick the cards in order to make a complete sentence. All About Fall – Regular Verb PracticeThe game includes 36 verb cards and 12 other game cards. Students pick a card and practice using the verb in the present and past tense. You can have the student use the word in a sentence or sort past tense verbs (e.g. what sound does the –ed ending make a /t/, /d/ or /Id/ sound?). There are 12 other game cards included for added fun! This is an excellent activity for English Language Learners (ELLs) and students whose community dialect may be impacting use of these grammatical endings in writing. This board game includes 24 games cards (6 different vocalic R types) and a game board. Use this game as classroom centers or during intervention or therapy to address articulation and/or phonics/decoding objectives. A selection of worksheets you can use as center or independent work for student who need additional support with discriminating /t/ and /k/ sounds. This is a great way to carry over skills targeted in Speech Therapy to the classroom. You can also use this resource for students in RtI TIER 2 or TIER 3 interventions. This card set includes 24 picture cards with [ch], [sh], and [j] in a variety of word positions. I created these cards for a few students who were working on these sounds. I used them with other board games to make therapy more fun. Create memory match games and/or use these cards as a progress monitoring tool (data sheet included). There are 16 word/picture cards you can use for targeting the following skills: 1) production of 3-4 syllable words, 2) sorting words by syllables, category or initial sound. This set includes a picture-based assessment and data sheet for 25 basic concepts. Concepts are presented in simple, 1 step directions. An excellent tool for preschool and kindergarten teachers! Here’s a useful data sheet you can use to track progress with decoding. Perfect for RtI progress monitoring!!! A progress monitoring tool and data sheets you can use to monitor progress on upper and lowercase letter identification. There are 6 different prompts that are color-coded with matching data sheets for easy tracking.